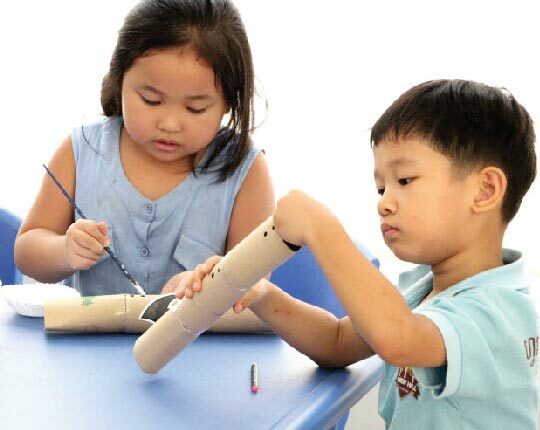 While each grade level has distinct curriculum, concepts and expectations, we use specific programs in our early primary grades that are developmental in nature and designed to accommodate the unique needs of young learners from Grade One through Grade Three. We use the A-Z Readings Program to ensure our children build on their knowledge of sounds (short vowels, long vowels, blends, phonograms and special blends) and add to their vocabulary. Phonics remains the basic sight words for each age group. Writing becomes a greater tool for communication and includes writing for meaning, sentences and paragraph building. Students begin to write their own stories and class books and use a variety of writing types. We use the Saxon Math Series in our Primary Program. Saxon Math was selected based on the math program’s incremental design and dedication to using manipulative and other concrete objects to build abstract thinking skills. This design fits well within the Montessori Philosophy of suing hands-on materials to develop practical thinking and learning skills. Saxon Math also uses math language and helps further develop critical thinking skills by involving writing in the process. Science and Social Studies are taught in themes, trying into the Language Arts curriculum and reinforcing common experiences for children. In Science, each grade level follows a cycle of themes, one for each of the areas of Science: Physical, Life, Earth and Health. In Social Studies, each grade level follows a cycle of themes, based on one theme for each of the strands in Social Studies: History, Geography, Culture and a special emphasis on Cambodian culture. All Science and Social Studies units and themes are actively-based, meaningful, and are designed to spark children’s natural curiosity, interests and enthusiasm. FHIS is registered to provide the Khmer Curriculum for the 2017/18 School Year and will offer a full program ratified by the MoEYS to ensure our students will be able to sit all exams and in future, successfully receive a full diploma. Our Khmer Program is available to all Cambodian students and complements our International program.